Recently renovated, near the sea and the pine grove, the Hotel Palladio is a 2-star family-run property with a garden, parking, services for children and abundant and genuine local cuisine. Admits pets of all sizes. The hotel is located between Pinarella and Cervia, a couple of minutes walk from the beach and near the coastal pine grove. The area is quiet but full of commercial activities. The rooms all have balconies - most with sea view - and feature new furniture, LCD TV, air conditioning, telephone, WI-FI, safe and private bathroom with shower and hairdryer. FAMILIES: family and connecting rooms are available. Garden, bicycles available, bar area, LCD TV room, relaxation room, reading room and restaurant, theme nights. PARKING: uncovered and free subject to availability. CONVENTIONS: beach, amusement parks, discos, INAIL / INPS. PETS: allowed of all sizes. BREAKFAST: sweet and savory buffet. LUNCH AND DINNER: romagnola cuisine reinterpreted with imagination in 3 menus with a choice of fish every day and vegetable buffet. Pasta and desserts are homemade. VARIATIONS: kitchen for vegetarians, celiacs. In hotel: strollers, pediatrician on request for a fee. In the room: side rails, cribs, bath tubs. At meals: personalized menus, baby food, baby food, bottle warmers, high chairs and flexible hours. 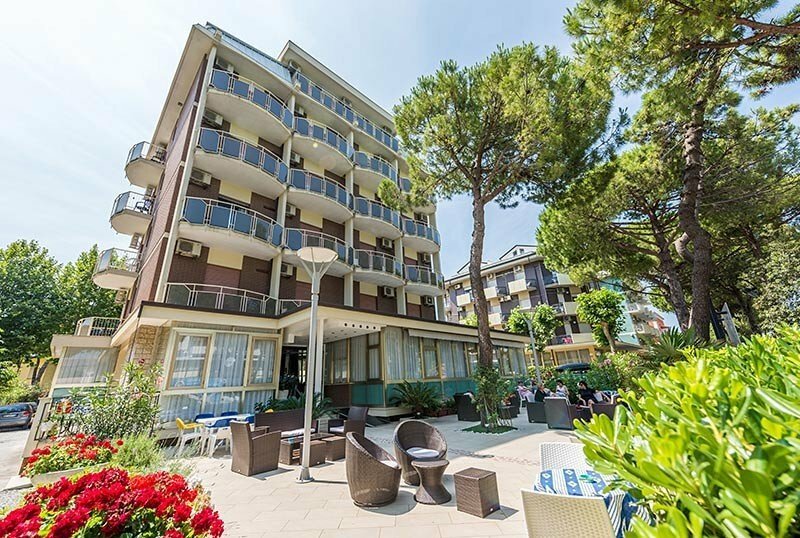 Hotel Palladio has agreements with three beaches: Bagno Olimpia 149, Bagno Luigi 150 and Bagno Casadei 153, all with beach umbrella, sunbeds and many services designed for relaxation and fun. Prices are per person per day for a minimum of 4 nights. - Stays less than 20% days. - The reductions are not applicable to connecting rooms for which the estimate is personalized. You wouldn't want to miss it? Possibility to buy tickets for Mirabilandia! Call for a personalized quote! Contact us for a personalized quote!